In Japan, no Buddhist sculptor is better known than Unkei. With his extraordinary artistic talent, he led a new era in sculptural expression, creating realistic works that appear before the viewer as though they were alive. For this Special Exhibition, Unkei’s masterpieces have been brought together from across Japan. 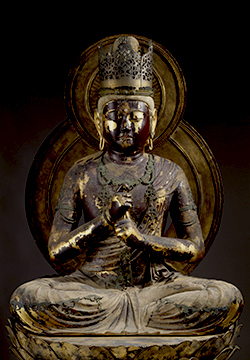 These include works from Kohfukuji temple in Nara, with which he had close relations. In addition to presenting an overview of Unkei’s life as a sculptor, the origins of Unkei’s remarkable style and its transmission will also be explored through the inclusion of works by his father, Kokei, as well as his sons, Tankei and Koben. Active in the early Kamakura Period, Unkei was one of the most influential artists in the history of Japanese Buddhist sculpture. As a youth, he honed his skill under the tutelage of his father Kokei, with whom he produced several collaborative works. Kokei is thought to have been a student of the sculptor Kojo, whose main base of activity was in Nara. 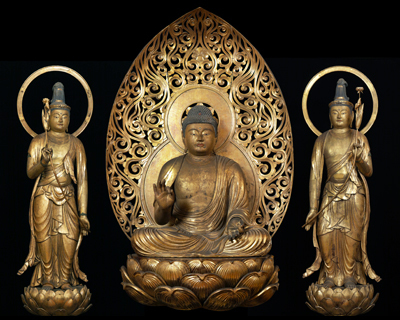 Around the time Kokei came to be recognized as a leading Buddhist sculptor of his day, his son and pupil Unkei produced his earliest extant work, Dainichi Nyorai (No. 4) for Enjoji temple in Nara. The defining feature of the style perfected by the Nara-based sculptors were the clear lines created by sharp variations in the depth or shallowness of the carving. This style differed substantially from the smoother and more gentle style that had been perfected by the great sculptor Jocho, who flourished under the continued patronage of the Kyoto aristocratic elite. 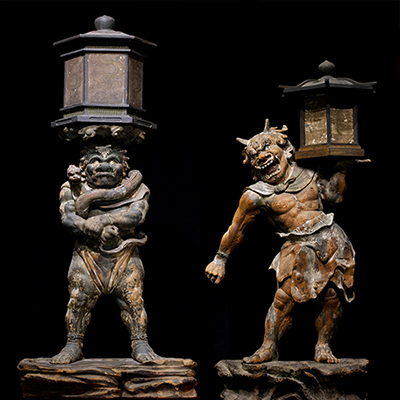 Both Kokei and Unkei maintained the primary features of the style they had inherited from earlier generations of Nara Buddhist sculptors but combined them with a wide range of other approaches and techniques to create their own distinctive artistic styles. 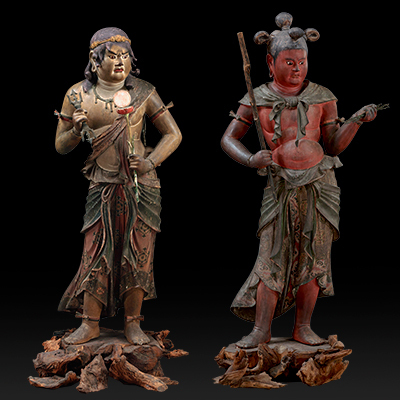 In this section, we trace their pursuit of the perfection of sculptural form by juxtaposing early works by Kokei and Unkei with pieces by other Nara Buddhist sculptors whose work directly influenced the evolution of their style. 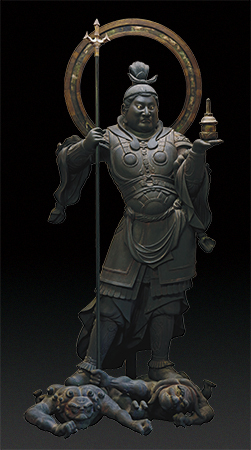 Unkei's original style can be observed for the first time in a set of five sculptures he carved for Ganjojuin temple in Shizuoka in 1186 (Bunji 2) at the order of the warrior Hojo Tokimasa. Judging from the quality of these images, it would appear that Unkei's artistic style had already matured fully by this time. 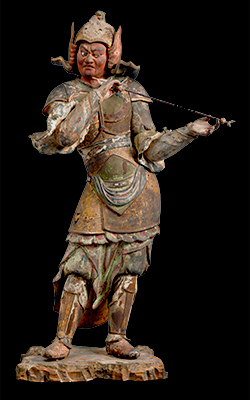 Buddhist images produced at the behest of members of the warrior class associated with the Kamakura Shogunate make up a significant portion of Unkei's body of work. Perhaps for Unkei, such projects provided an opportunity to let his creativity run free, unconstrainted by the bounds of established tradition. Nevertheless, it was Nara which remained the true center of Unkei's various activities. Around the year 1186 (Bunji 2), he carved the principal icon (Buddha Head, No. 6) of the newly rebuilt Western Golden Hall of Kohfukuji temple; in 1203 (Kennin 3) he fashioned a pair of enormous Vajra Warriors for Todaiji temple; and in 1212 (Kenryaku 2), he completed standing images of Mujaku Bosatsu and Seshin Bosatsu (No. 20) for the restored Northern Round Hall of Kohfukuji. Taken together, these and other works highlight the central role Unkei played in the restoration of Nara temples such as Kohfukuji and Todaiji in the wake of their destruction by the Taira forces during the Genpei Wars. Unkei also received commissions from various aristocratic families. His rendition of the Eight Youths Attending Fudo Myo'o (No. 18) for Kongobuji temple in Wakayama imbues this group of coarse characters with an aura of intelligence and elegance on the one hand, and a brimming sense of vitality on the other. We hope visitors will enjoy the masterful realism and powerful sense of movement characteristic of Unkei's style, which not only captures the materiality of the physical figure, but also suggests a spiritual depth not visible to the human eye. 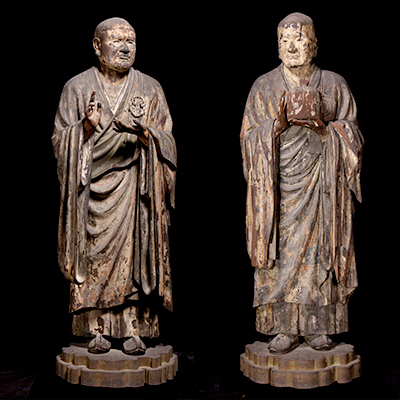 Unkei had six sons, all of whom became Buddhist sculptors. Sculptures by Tankei, Koben, and Kosho survive to this day. The present exhibition focuses particularly on the work of Tankei and Koben. 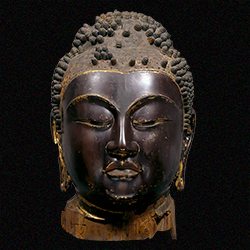 As Unkei's successor, Tankei headed the Kei school of Buddhist sculpture until the middle of the 13th century. 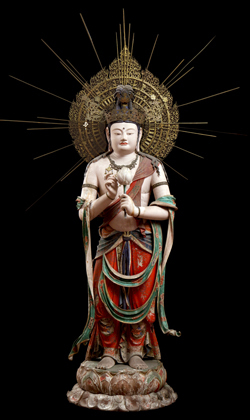 Several of his works are extant, including the seated image of the Thousand-Armed Kannon Bosatsu that serves as the principal icon of the Sanjusangendo hall of Rengeoin temple in Kyoto. Perhaps because it was produced in collaboration with the sculptor Kaikei, this image evokes Kaikei's refined and serene style more strongly than Unkei's powerful and dramatic approach. Other images by Tankei, such as his realistic and sensitive renderings of animals and young attendants, however, do hint at the influence of Unkei's work, to which Tankei added an individual note all of his own. Unkei's influence is more readily apparent in the standing image of the demon Ryutoki (No.35), whose realistically rendered musculature suggests that its sculptor, Koben, may well have used an actual wrestler as his model. The large groups of works to which Unkei might have contributed, or which were carved by his successors or contemporaries play an essential role in defining the sculptural style of this artistic genius. In this section, we therefore aim to give a sense of the diffusion of Unkei's style, both in his own time, and in the generation that followed. ＊ Special exhibitions "The Living Treasures of France" (Tuesday, September 12 - Sunday, November 26, 2017 Hyokeikan) requires separate admission fees. Catalog, Audio guide The exhibition catalog (3,000 yen) is available at the Heiseikan Special Exhibition Shop and at the museum shop in Honkan (Japanese Gallery). Audio guide (Japanese, English, Chinese, Korean) is available for 520 yen. This thematic exhibition explores how sculptors inherited and transformed the style of Unkei in the Kamakura period (1192–1333).